Freshman Tyree Sutton pinned top-seeded Andrew LaMura of RBC in 3:06 to capture the 182-pound championship of the 2012 District 22 Tournament at Red Bank Regional on Saturday. The title is the first for Keansburg since 2008, 5th overall, and is also the first won by a freshman for the program. In recognition of his championship, Sutton was voted as the Most Outstanding Wrestler of the tournament which is also a first for the Keansburg program. With the title, Sutton receives a bye into the quarterfinal round of the Region 6 Championships in Toms River. Also advancing to the Region Tournament will be sophomore Romello Union who placed 3rd at 132 pounds. The trip will be the second for Union who was a District runner-up in 2011. He will compete in the opening round of the tournament on Wednesday night. Sophomores Romello Union (2nd place D22 in 2011) and Carlos Fontanez, and seniors Valquan Rush and Jose Jara give the Titans a strong foundation down low as several newcomers are broken into the lineup. That foursome combined for over 60 wins in 2011 and should easily top that number in 2012. 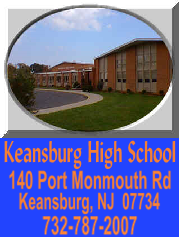 Keansburg has a good amount of experience returning in the upperweights as senior Matt Keddell and juniors Brad Baker, Yann Makayat, Brandon Nelan, and Anthony Sandi all return. Incoming freshmen Tyree Sutton and Tony Demir are among the new faces that will look to make an immediate impact. The Titans have strong numbers, especially in the middle, and over a dozen wrestlers returning who saw varsity action in 2011. The key date on the schedule appears to be the matchup with Pt. Beach on January 14th as the winner should have the inside track to the B-Central title. Union put together one of Keansburg's best ever freshman seasons, tying for the team lead in wins with 22, and qualifying for the Region 6 Tournament after finishing in 2nd place at the Districts.